The original Nathaniel Griswold was a good story all by himself. A New York merchant in business with his brother George – as N.L.& G. Griswold & Co. – he managed a fleet of more than 40 ships sailing in the tea trade. The brothers’ flagship was “The Panama” and the firm’s tea was marketed with the name and image of the ship on every tea chest. Nathaniel Griswold’s daughter, Catherine, married Pierre Lorillard III, thus merging two fortunes fashioned from dry leaves. Pierre and Catherine’s son, Pierre (Peter) Lorillard IV, continued to head the tobacco company, but also developed Tuxedo Park, a village retreat in the Ramapo Mountains north of New York City. It was here that Griswold Lorillard became famous for something he didn’t do. Many sources will assure you that he invented the tuxedo. In 1886, he did cut the tails off his tailcoat and don a scarlet waistcoat as a way of goofing on his elders at Tuxedo Park’s first Autumn Ball. But his shortened jacket did not look like today’s tuxedo jacket, rather more like the short, tight mess jacket worn by footmen and waiters. The real tuxedo jacket, not to get too far afield here, came to Tuxedo Park in 1886 via James Potter, a wealthy coffee broker and one of the village’s first residents, who met the Prince of Wales – later King Edward VII – at a ball in England and was invited to his Sandringham estate for a weekend, mostly because Potter’s wife, Cora Brown-Potter, was a hottie. Mr. Potter asked what he should wear; the Prince said that he wore a shorter jacket for dinner in the country and if Potter went to his tailor, Henry Poole & Co., he could have one made. 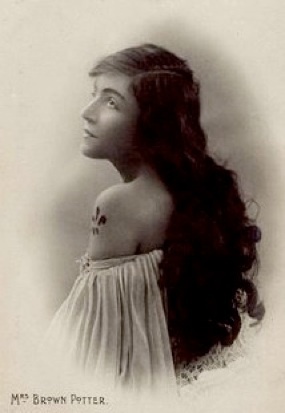 After his summer holiday, Potter returned to America and Tuxedo Park, but without his wife, who decided to leave her husband, stay in England and become an actress. Returning home alone, Potter at least had his new jacket for consolation. Pierre Lorillard IV and others found it to be the bee’s knees for informal dinners, and had it copied. They wore their dinner jackets to Delmonico’s in New York, and when others asked about them, they were told, “That’s what they wear up in Tuxedo.” And hence “the Tuxedo jacket” gained its name. In August of 1882, while still in his teens, Griswold played polo at Newport, R.I., as a member of the Westchester Polo Club. Spectators included Newport cottagers and an occasional guest such as Oscar Wilde, then on a lecture tour of America. Griswold also sailed at Newport, attended balls in New York, ushered at society weddings. In the spring of 1886, free from care, Griswold Lorillard dined at England’s Hurlingham Club, the home of English polo. He mentioned that polo was played in the United States. His hosts expressed surprise and suggested a sporting meeting between the best of each country. Griswold cabled the Westchester club’s secretary, Frank Gray Griswold (another branch of the tea tree) and soon arrangements were made for an English team to travel to the United States and play at Newport. 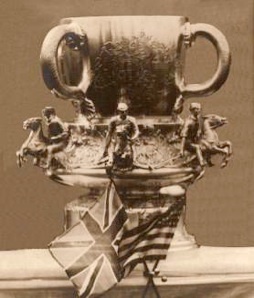 The Westchester Polo Club commissioned a silver trophy to be claimed by the winner, and in the last week of August, at the height of the Newport social season, the two teams met to play for the International Challenge Cup, the first-ever international competition in the sport of polo. The English team had two things in their favor – teamwork and the revolutionary backhand shot of John Watson – and they made hash of the Americans – 10-4, 14-2 – to spirit the trophy back to England. The rivalry for the Cup became one of the most storied in sports, with legendary matches before and after World War I, matches played before as many as 40,000 spectators. In 1909, an American team – the famed Big Four – brought the Cup back to the U.S.A., but Griswold Lorillard was not there to see it. He had been blessed with every advantage except good health. Two years after setting the wheels of sporting history in motion, he had died of consumption at Rancocas Farm. He was 24 years old. Raise a glass to Griswold Lorillard. He deserves to be remembered.